CloudStack is an open source software platform that pools computing resources to build public, private, and hybrid Infrastructure as a Service (IaaS) clouds. CloudStack manages the network, storage, and compute nodes that make up a cloud infrastructure. Use CloudStack to deploy, manage, and configure cloud computing environments. The Cloudstack management Server system can be a physical machine or virtual machine with access to a supported database. CPU – one 64-bit CPUs or one 64-bit processor. database runs on the same machine. Memory – 1GB RAM. Memory requirements might be higher if the database runs on the same machine. Disk storage – 2GB. Disk requirements might be higher if the database runs on the same machine. 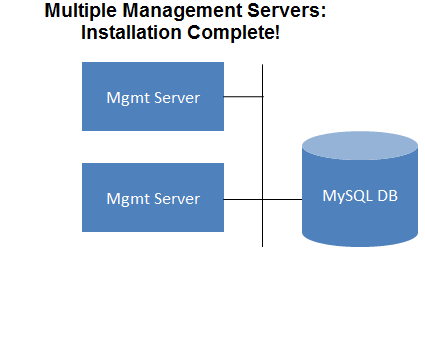 MySQL disk requirements depends on the size of infrastructure. Networking – Gigabit connection recommended. Before we begin with the instalation a CentOS 6.x or RHEL 6.x need to be ready with basic pachage installaed. 1) To add the CloudStack repository, create /etc/yum.repos.d/cloudstack.repo and insert the following information. 5) Type following command in root previledge to start he installation of cloudstack-management server. 6) Type following command to install usage server. 9) Login to MySQL database using #MySQL -u root -p and enter following command to provide root privilege to database. 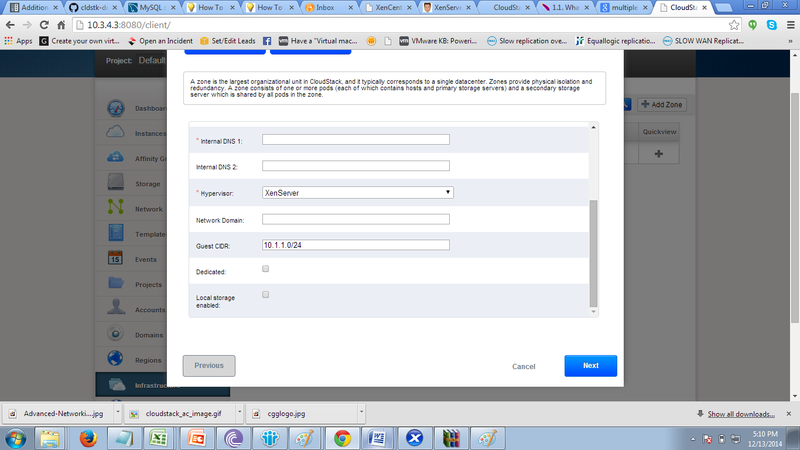 10) Once the database core configuration finised we can proceed with cloudstack database setup. 11) Open the MySQL configuration file. The configuration file     is /etc/my.cnf or /etc/mysql/my.cnf, depending on OS and  Insert the following lines in the [mysqld] section. 16) Upgrade the management server. 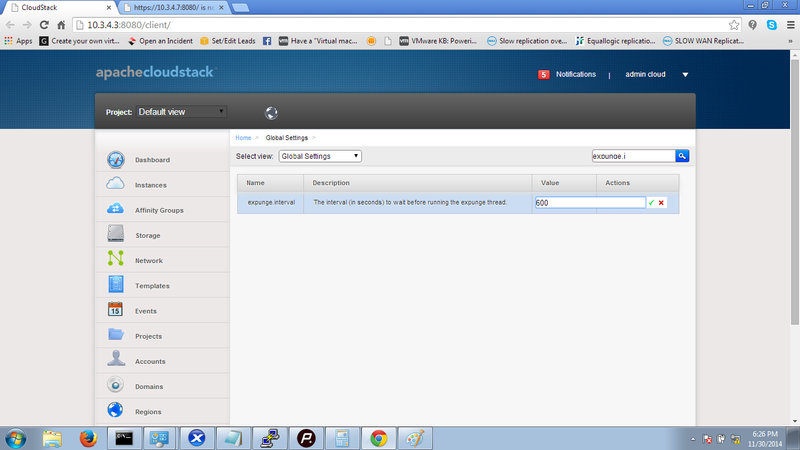 Once the installation of cloudstack completes we can start configuration of cloudstack environment from web console. 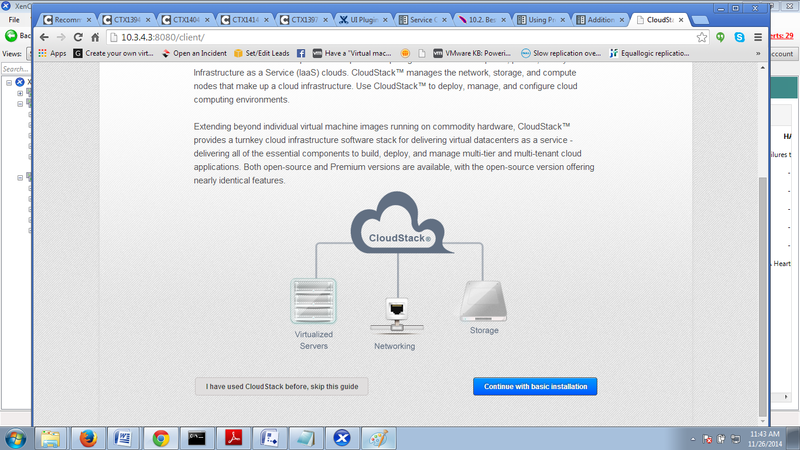 Click on I have used cloudstack before, skip this guide. 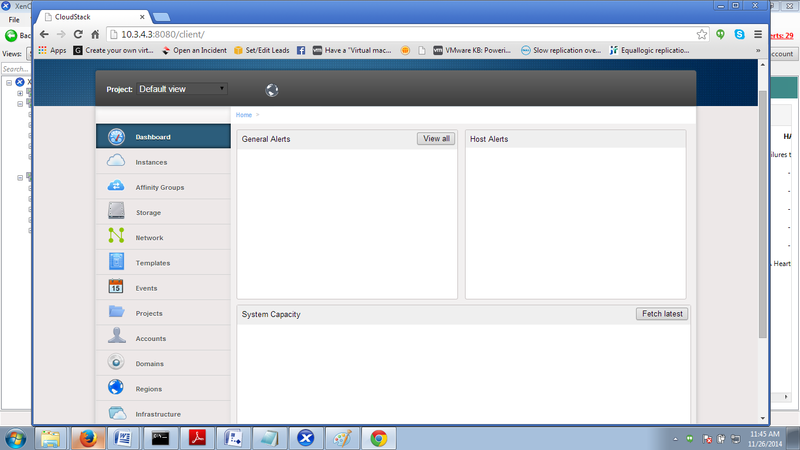 Cloudstack will navigate to follwoing deshboard screen. Click on Infrastructure Tab to proceed with initial configuration. Click On Zones View All button and then click on Add Zone button in top right cornor. New Zone creation Wizard will open. Select Advanced zone. NOTE: Do not select Security group option. This option will eliminate many of the advanced zone features. Enter follwoing details for new zone. 3) Internal DNS ip address for cloud virtual machines. 5) Enter Network Domain of existing infrastructure. Leave Dedicated and local storage enabled option unchecked. Drage the Guest and public traffic to seprate port for management and cloud traffic segrigation. Click on Edit and edit the network lebal of xenserver network lable in traffic type. NOTE: above configuration is case sensitive therefore all the characters should be same as xenserver network label charecters. 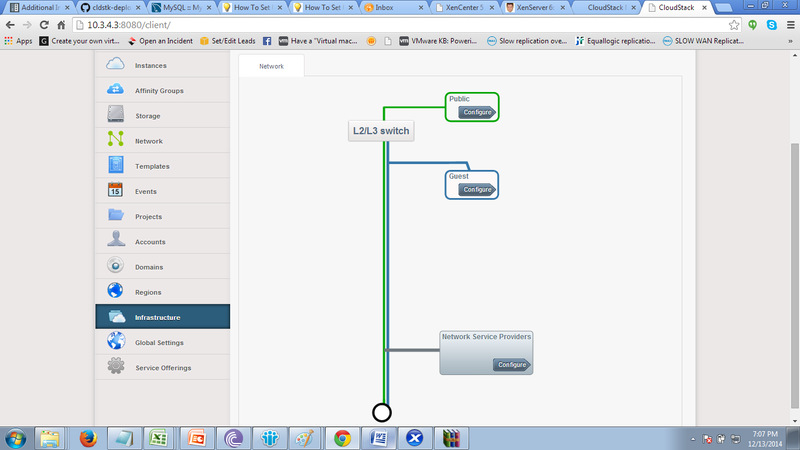 Enter the Actual LAN ip details with start and end ips for network pool through which cloud private ip will be NATed. Click Next. Enter the pod name which will be acting as a container for both the clusters. 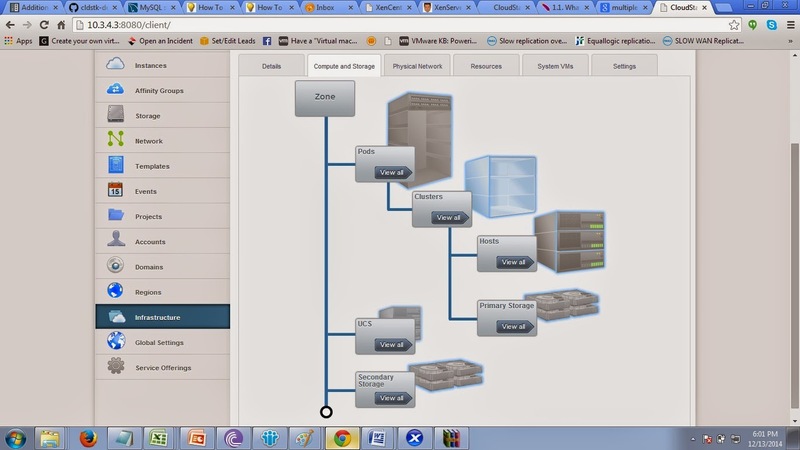 start and end system reserved ip defines the pool of ip which will be assigned to cloud management servers (eg. System VM, virtual router etc.). Cloudstack advanced zone provides software defined network hence each account will be assigned with VLANs and each virtual private cloud will be segregated using their respective VLANS. 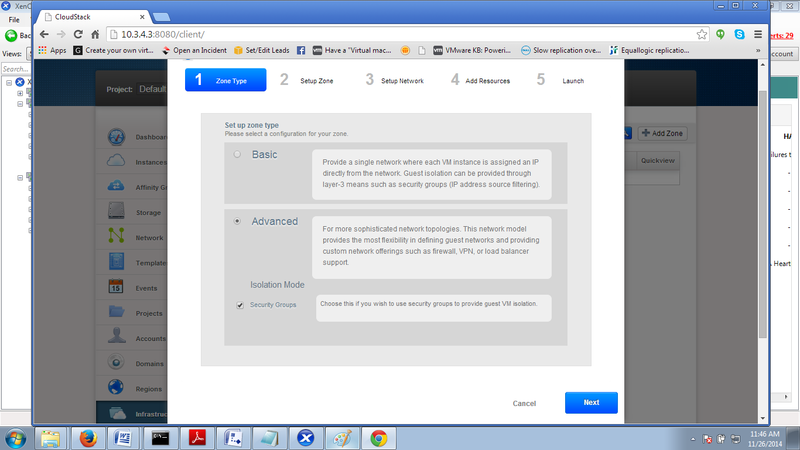 Enter the host name or ip address of master host in selected cluster. Enter the details of primary storage. 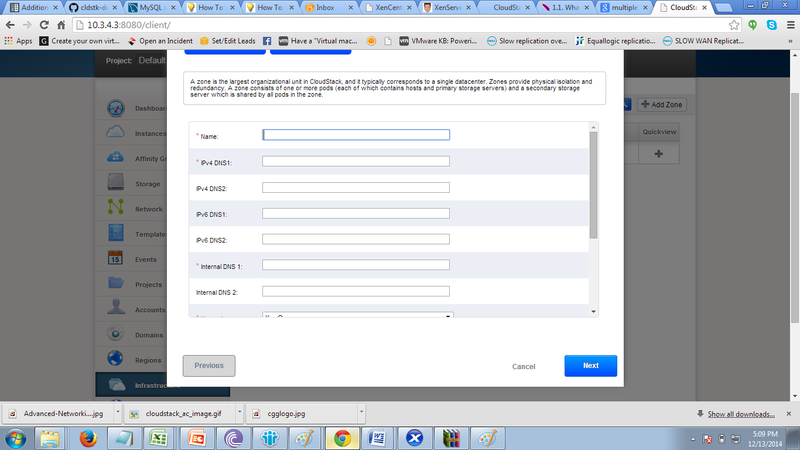 Name is the primary storage name which will be displayed in cloudstack console. 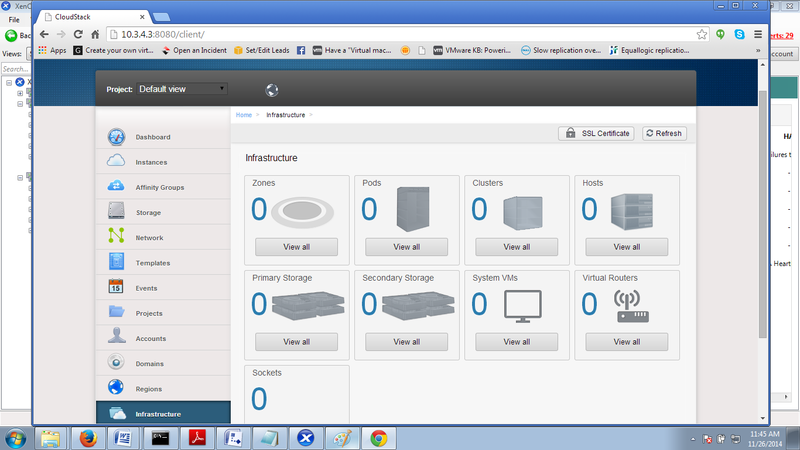 Select the cluster option in Storage menu. If we are using FC configured storage then select PreSetup option in protocol parameter. Cloudstack requires secondary storage to store static instance data such as template, iso, snapshots etc. 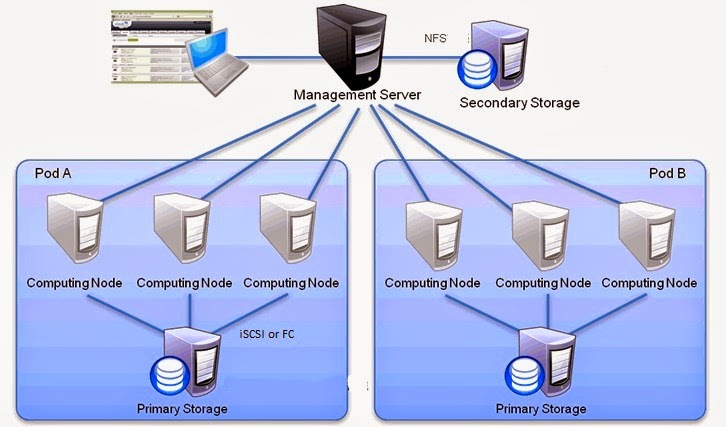 Select NFS in provider attribute followed by name of secondary storage. 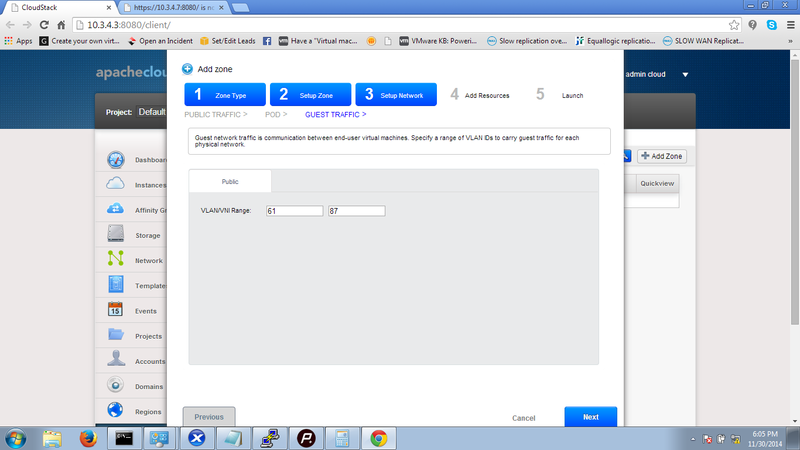 Enter the nfs share server IP address followed by the share path. 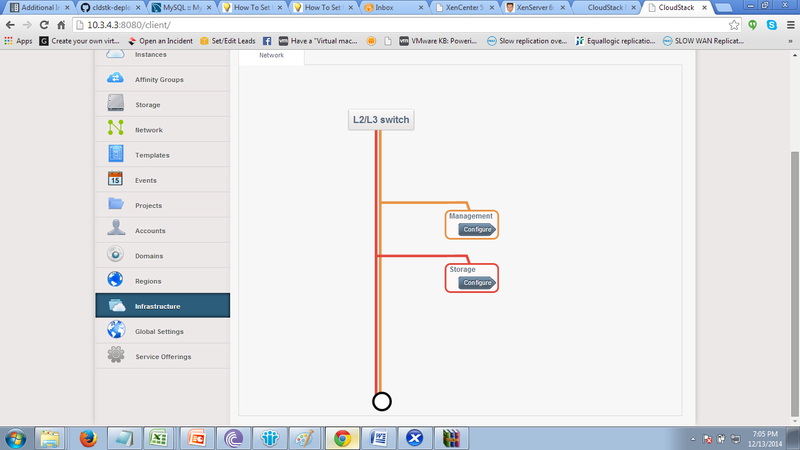 verify the entered parameter for creating zone and click finish. Once the wizard completed a zone will be created with single cluster. NOTE: Do not enable the zone after the wizard is completed. After the zone is enabled, cloudstack will create Secondary storage virtual machine (SSVM) and console proxy virtual machine. After the initial configuration we need to customize few global system variable to customize the cloudstack default behaviour. Click on the left navigation bar and select global settings. in the top right side search box type: expunge and change the value of expunge interval and expunge delay to 600 and click on save icon. In order to upload iso and template cloudstack requires HTTP supported web service repository. 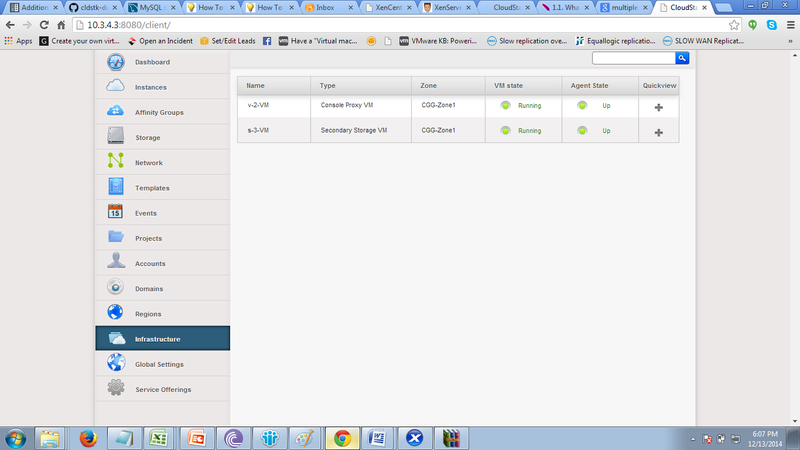 and to provide access to specific repository modify following global settings parameter. Apache best practice is to allow virtual machine to over provision the memory and cpu resources 2 time then original hardware resource. In order to configure dynamic scaling of cpu and memory offerings change following parameters. By default 100 Mbps speed will be allowed to each cloud talent virtual machine to increase the speed to 1000 Mbps modify following parameter. Feel free to comment if advanced configuration details and description required for cloudstack.